Manufacturer of a wide range of products which include work holding fixtures clamping accessories. Being the leading names, we offer world-class array of Clamping Accessories for Work-holding Fixtures that are valued among the clients for high quality and durable standards. Our entire product range is performance based and are delivered as per the enact preferences of our clients. 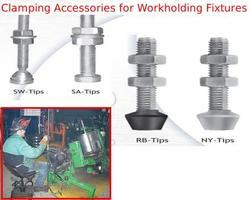 Looking for Clamping Accessories for Workholding Fixtures ?